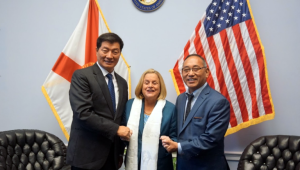 (TibetanReview.net, Nov17, 2018) – President Lobsang Sangay of the Central Tibetan Administration (CTA) at Dharamshala, India, was stated to have met with some US lawmakers as well as Senate and House staffers during his visit to Washington, DC, over Nov 13-15. He has also met with some state department officials without any reported protest from China. 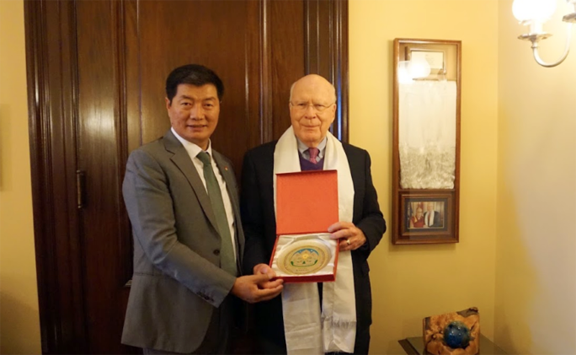 One of his last day’s meetings was stated to be with Senator Patrick Leahy whom the CTA’s Tibet.net Nov 16 described as “dear friend of His Holiness the Dalai Lama and one of the biggest supporters of the Tibetan people’s right to live in dignity and freedom”. Leahy has served in the US Congress for 44 years. The other meetings during the day were stated to be with Congressman Peter Roskam, Chair of the House Democracy Partnership (HDP), and Ranking Congressman David Price. The meetings with Roskam and, presumably, with Price were stated to be his first. The day before, he was reported to have met with outgoing Congresswoman Ileana Ros-Lehtinen. He was also stated to have taken part in a round-table conversation with 11 Senate and House staffers. It was organized by Nima Binara, Counsel of Senator Leahy. The issues discussed were stated to include US policies towards China, opportunities to advance the Tibet issue through legislative means, and strategies to further strengthen political advocacy for Tibet. He was also stated to have met with Reva Price, House Democratic leader Nancy Pelosi’s legislative aide. He has also met with representatives of the United States Agency for International Development (USAID), which had provided multi-million dollar aid for CTA-run Tibetan projects. 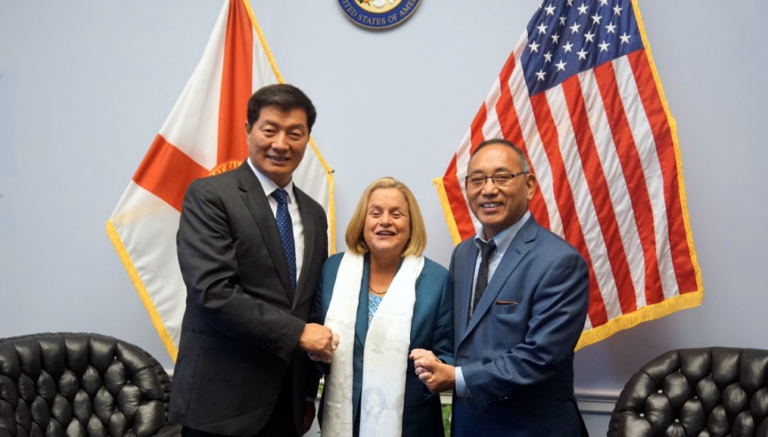 Earlier, on his first day, Sangay was stated to have taken part in an event called “Tibet and the Belt and Road Initiative: Lessons Learned from the Tibetan Experience with Chinese Infrastructure Projects” organized by the Congressionally funded National Endowment for Democracy. He has also met with Congressman Jim McGovern on that day. Another “high level” meeting he had was reported to be with Samuel Brownback, the US Ambassador at Large for International Religious Freedom. Other meetings he had with officials of the US Administration were stated to be those with Ivan Kanapathy, Director for China, Taiwan, and Mongolia, National Security Council; Laura Stone, Deputy Assistant Secretary of State, Bureau of East Asian and Pacific Affairs; Tom Vajda, Acting Deputy Assistant Secretary for Security and Transnational Affairs, Bureau of South and Central Asian Affairs; and David Ranz, Acting Deputy Assistant Secretary, Bureau South and Central Asian Affairs. Besides, Sangay was reported to have met with representatives in the State Department’s Bureau of Democracy, Human Rights, and Labor and Bureau of Population, Refugees, and Migration. Other events he took part in were stated to include a round-table discussion with scholars and academics at the Hudson Institute and a dinner programme with some 40 Chinese friends and 15 Tibetans from the local community.